On the 4th of November the steamship Arizona of the Guion Line, sailed from New-York under the command of Capt. Thomas Jones, bound for Liverpool. 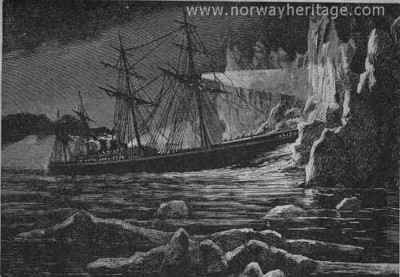 On Friday the 7th, at about 9:10 o'clock, she met with a frightful accident while crossing the northern edge of the Newfoundland Banks, when she ran headlong on a huge iceberg. This occurred, as nearly as could be ascertained, in 47º north latitude and 53º west longitude. At the moment she struck the iceberg she was going at the rate of 15 miles an hour. The crash was terrific and spread dismay among the 300 persons on board, comprising the passengers and crew. For a moment a panic was imminent, but the coolness of a few passengers dissipated the danger, and the hands of the officers were left free to work out the salvation of the ship. At the time of the collision the ship was in charge of the second officer, Mr. John Wynn Jones. The Captain had left the bridge at 9 o'clock, intending to turn in, and 10 minutes later the catastrophe occurred. The first days of the voyage from New York had been very favourable. In the first 26 hours’ run from Sandy Hook she made 280 miles; the second day’s log showed 163, and the third day's reckoning was the same. During the first two days the wind was astern and the ship sped on her way, driven by sail and steam. On the third day out the wind changed and blew from the north, but not sufficiently to retard the ship's progress. On Friday evening, without a moment’s warning, and before any one could realize what had occurred, a terrible crash was heard. The hull of the steamer shook as though every rivet had burst asunder. Towering above the steamer’s bow rose a huge iceberg, threatening her with instant destruction. Out of the submerged field rose three huge, cone-shaped masses, 60 or 70 feet into the air. There was danger that one of these would topple over and crush the ship. In the few moments which followed this discovery, men seemingly lived years of agony. The affrighted sailors of the watch fled behind the bridge, and, thinking only of their own safety, set to work to launch one of the boats. One of these men wept in abject terror; another spread dismay among the more frightened passengers by stating that the ship was sinking rapidly. The steamer on striking the iceberg listed heavily to starboard and sunk visibly forward, creating the impression that she was settling at the bows, which, broken and twisted, no longer offered a barrier to the inrushing water which rapidly filled the forepeak. Between the passengers and destruction there stood only the slight barrier formed by the collision bulwark, but at first it was impossible to tell whether it had not also been driven in. A hasty examination revealed the fact that the bulkhead had not given way and that the fore hold was free from water. 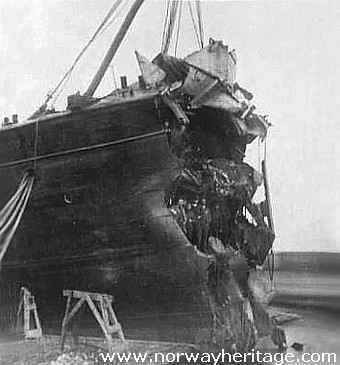 A boat was then lowered and the first officer proceeded to examine the breach in the bow which was found to be 20 feet broad by 30 feet deep. When he made his report it was announced that the ship would lay to for the night, and that in the morning measures would be taken to repair the damage. Subsequently, on consultation with Mr. Guion, one of the owners, who, with several members of his family, were on board, it was decided to make for St. John, Newfoundland, the nearest port of refuge. The weather continued perfectly calm, and the disabled ship made good headway toward St. John. At 8 in the evening the lights on the coast were sighted, and by 10 o'clock the town lights could be distinctly seen nestling in the shadow of the rocky coast. Signal guns were fired, but no notice was paid to them from the shore. In the morning a pilot came off and brought the Arizona safely in. Her arrival created an immense sensation, and thousands of people visited her at Shea's wharf, while she waited for repairs. There she was fitted with a temporary bow of wood to permit her to sail for Glasgow where a new bow of iron was fitted by her original builders, John Elder & Co. The cause of the accident was the failure to keep a proper lookout. At the moment of the collision the sailors, who should have been forward in the bows, were back of the bridge in a position where it was impossible to see over the ship's course. No lives were lost in the collision, though the sailors in the forecastle had an almost miraculous escape. A few men were slightly injured, but none seriously. Some of the passengers of the Arizona were forwarded by the Allan Line steamer Caspian, from St. John, the next Thursday, and the rest by the Guion steamship Nevada, which sailed from New-York the next Tuesday, and made a special call at St. John to pick them up.